Beard, K. C., Ni, X. Wang, Y. Meng, J. & Gebo, D. L. (2016). Dentition of Subengius mengi (Mammalia: Plesiadapoidea) and a reassessment of the phylogenetic relationships of Asian Carpolestidae. Vertebrata PalAsiatica, 54(3), 181-211. Beard, K. C. (2013). Anthropoid origins. In D. R. Begun (Ed. ), A Companion to Paleoanthropology (pp. 358-375). Chichester, United Kingdom: Wiley- Blackwell. Wang, Y. Meng, J. Jin, X. Beard, K. C., Bai, B. Li, P. Ni, X. Li, Q. & Gebo, D. L. (2011). Early Eocene perissodactyls (Mammalia) from the upper Nomogen Formation of the Erlian Basin, Nei Mongol, China. Vertebrata PalAsiatica, 49(1), 123-140. Miyata, K. Tomida, Y. Beard, K. C., Gunnell, G. F., Ugai, H. & Hirose, K. (2011). Eocene mammals from the Akasaki and Nakakoshiki formations, western Kyushu, Japan: Preliminary work and correlation with Asian land mammal ages. Vertebrata PalAsiatica, 49(1), 53-68. Beard, K. C., Wang, Y. Meng, J. Ni, X. Gebo, D. L., & Li, C. (2010). Paleocene Hapalodectes (Mammalia: Mesonychia) from Subeng, Nei Mongol: Further evidence of 'East of Eden' dispersal at the Paleocene-Eocene boundary. Vertebrata PalAsiatica, 48(4), 375-389. Gebo, D. L., Dagosto, M. Beard, K. C., Ni, X. & Qi, T. (2008). A haplorhine first metatarsal from the middle Eocene of China. In J. G. Fleagle & C. C. Gilbert (Eds. ), Elwyn Simons: A Search for Origins (pp. 229-242). New York: Springer. Dagosto, M. Gebo, D. L., Ni, X. Qi, T. & Beard, K. C. (2008). Primate tibiae from the middle Eocene Shanghuang fissure-fillings of eastern China. In E. J. Sargis & M. Dagosto (Eds. 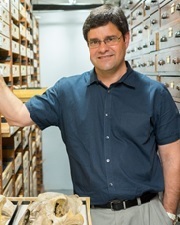 ), Mammalian Evolutionary Morphology: A Tribute to Frederick S. Szalay (pp. 315-324). Dordrecht, The Netherlands: Springer. Beard, K. C. & Luo, Z. (Eds.). (2007). Bulletin of Carnegie Museum of Natural History 39. Mammalian Paleontology on a Global Stage: Papers in Honor of Mary R. Dawson. Beard, K. C. (2004). The Hunt for the Dawn Monkey: Unearthing the Origins of Monkeys, Apes, and Humans, University of California Press, Berkeley. Gebo, D. L., Dagosto, M. Beard, K. C., Qi, T. & Wang, J. (2000). The oldest known anthropoid postcranial fossils and the early evolution of higher primates. Nature, 404, 276-278. Beard, K. C., Tong, Y. Dawson, M. R., Wang, J. & Huang, X. (1996). Earliest complete dentition of an anthropoid primate from the late middle Eocene of Shanxi Province, China. Science, 272, 82-85. Beard, K. C., Qi, T. Dawson, M. R., Wang, B. & Li, C. (1994). A diverse new primate fauna from middle Eocene fissure-fillings in southeastern China. Nature, 368, 604-609. Beard, K. C., Krishtalka, L. & Stucky, R. K. (1991). First skulls of the early Eocene primate Shoshonius cooperi and the anthropoid-tarsier dichotomy. Nature, 349, 64-67. Beard, K. C. (1990). Gliding behaviour and palaeoecology of the alleged primate family Paromomyidae (Mammalia, Dermoptera). Nature, 345, 340-341. Krishtalka, L. Stucky, R. K., & Beard, K. C. (1990). The earliest fossil evidence for sexual dimorphism in primates. Proceedings of the National Academy of Sciences, 87, 5223-5226. Beard, K. C., Dagosto, M. Gebo, D. L., & Godinot, M. (1988). Interrelationships among primate higher taxa. Nature, 331, 712-714. Beard, K. Christopher, (Principal), Into Africa: The Initial Colonization of Africa by Early Cenozoic Anthropoids, National Science Foundation, $211,000, (01/01/2014 . Foundation. Status: Funded. Beard, Kenneth Christopher, (Principal), Taylor, Michael, (Co-Principal), INSPIRE: Forging new connections among mammalian evolution, climate change, and tectonics during the Eocene of Turkey, the biogeographic nexus linking Africa, Europe and Asia, National Science Foundation, $580,965, Submitted 04/20/2015 (06/15/2015 - 05/31/2020) . Federal. Status: Funded. Beard, K. Christopher, (Principal), Into Africa: The Initial Colonization of Africa by Early Cenozoic Anthropoids, BCS 1157142, National Science Foundation, $175,000,(01/01/2012 - 12/31/2014) . Foundation. Status: Funded. Rawlins, J. E., Wible, J. R., Handron, K., Olsen, S. L., Beard, K. Christopher, (Co-Principal), Acquisition of a Variable Pressure SEM to enable Research, Education, and Services at Carnegie Museum of Natural History, DBI 0821644, National Science Foundation, $280,000, - 12/31/2008) . Foundation. Status: Funded. Beard, K. Christopher, (Principal), Collaborative Research: Paleontological Investigation of Early Primate Evolution in Asia, BCS 0820602, National Science Foundation, $173,212, - 12/31/2008) . Foundation. Status: Funded. DeWalt, B., Hamann, B., Beard, K. Christopher, (Co-Principal), Vertebrate Paleontology Collection of the Carnegie Museum of Natural History, United States Department of the Interior: Save America’s Treasures Program, $450,000, - 12/31/2005) . Federal. Status: Funded. Meng, J., Beard, K. Christopher, (Co-Principal), Investigating the Origin and Early Evolution of Primates in Asia, BCS 0309800, National Science Foundation, $267,002, - 12/31/2003) . Foundation. Status: Funded. Beard, K. Christopher, (Principal), SGER: Salvaging a Unique Early Eocene Biota from the Gulf Coastal Plain of Mississippi, DEB 0073414, National Science Foundation, $60,001, - 12/31/2000) . Foundation. Status: Funded. Beard, K. Christopher, (Principal), Paleoanthropological Survey for Early Anthropoids and Hominoids in Tibet, The Leakey Foundation, $12,000, - 12/31/1999) . Foundation. Status: Funded. Beard, K. Christopher, (Principal), Paleontological Field Work and Research on Eocene Anthropoids and other Primates from the People’s Republic of China, SBR 9615557, National Science Foundation, $269,275, - 12/31/1997) . Foundation. Status: Funded. Beard, K. Christopher, (Principal), Early Anthropoid Primates of the Yuanqu Basin, central China: A Paleoanthropological Rescue Mission, The Leakey Foundation, $10,000, - 12/31/1995) . Foundation. Status: Funded. Dawson, M. R., Berman, D. S., Beard, K. Christopher, (Co-Principal), Renovation of the Vertebrate Paleontology Collections at Carnegie Museum of Natural History, DEB 9222284, National Science Foundation, $618,259, - 12/31/1993) . Foundation. Status: Funded. Dawson, M. R., Black, C. C., Beard, K. Christopher, (Co-Principal), Rescue of Late Eocene Vertebrates, Yuanqu Basin, China, DEB 9310509, National Science Foundation, $34,520, - 12/31/1993) . Foundation. Status: Funded. Dawson, M. R., Beard, K. Christopher, (Co-Principal), Paleontological Investigation of Middle Eocene Primate-Bearing Fissure-Fillings in Southeastern China, DBS 9221231, National Science Foundation, $204,000, - 12/31/1992) . Foundation. Status: Funded. Beard, K. Christopher, (Principal), Paleontological Exploration of the Eocene Melawi Formation in Western Kalimantan (Indonesia), 4665-91, National Geographic Society, $24,250, - 12/31/1991) . Not-for-Profit (not Foundation). Status: Funded. Beard, K. Christopher, (Principal), Mammalian Paleontology of the Early Cenozoic Tuscahoma Formation, Eastern Mississippi, 4299-90, National Geographic Society, $9,000, - 12/31/1990) . Not-for-Profit (not Foundation). Status: Funded. Krishtalka, L., Dawson, M. R., Stucky, R. K., Beard, K. Christopher, (Co-Principal), Paleocene and Eocene Faunas of the Wind River Basin, Wyoming: Excavation, Preparation and Research, BSR 9020276, National Science Foundation, $148,946, - 12/31/1990) . Foundation. Status: Funded. Beard, K. Christopher, (Principal), Mammalian Paleontology of the Early Eocene San Jose Formation, San Juan Basin, New Mexico, Sigma Xi grant-in-aid of research, - 12/31/1988) . Not-for-Profit (not Foundation). Status: Funded. Beard, K. Christopher, (Principal), New Species of the Diminutive Primates Micromomys and Tinimomys from the Early Eocene of Wyoming, Sigma Xi grant-in-aid of research, - 12/31/1988) . Not-for-Profit (not Foundation). Status: Funded. Beard, K. Christopher, (Co-Principal), Skeletal Anatomy and Locomotor Adaptations of the Early Tertiary Plesiadapiformes (Mammalia, Primates), BSR 8801037, Doctoral Dissertation Improvement Grant, National Science Foundation, $9,809, - 12/31/1988) . Foundation. Status: Funded.